Celebrating Lorne Oliver's work, Indie Authors, and those who kill people on paper! I've been out of the blog game for a while. The new job is taking up a lot of my time, but I'm working on balancing it out. 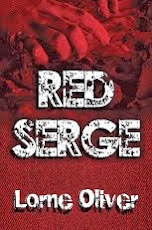 Red Serge is being edited again. There were a few typos and miss-steps so I'm getting through it. I have a title for the next Alcrest Mystery...but I'm not telling yet. Thanks to my wife I will be at a few shows sellings books and some awesome swag. THE CISTERN will be FREE August 13th and 14th!!!!!!!!! Woooohoooo!!!!! If you haven't checked out my new mystery with some really great new characters download it for free and then be sure to let me know your thoughts. Be Scared for 2 Months!!! !